What a great place for a birthday party! 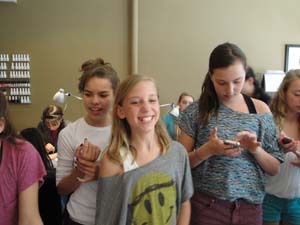 You’re turning eleven and you invite your girlfriends to, ta-tah, “Girlfriends.” Girlfriends—a professional nail and girlie boutique (even their web site is fun)–is on Tower Road just off Green Bay in Winnetka. It’s classy and the choices of colors and techniques are amazing. I drew all twenty girls in an hour and a half, working with Utrecht markers on foam core, 20 x 32. Cake and refreshments were on a long table in the middle of all this fun, glamor and style. Hey, they’ve done this before at Girlfriends! 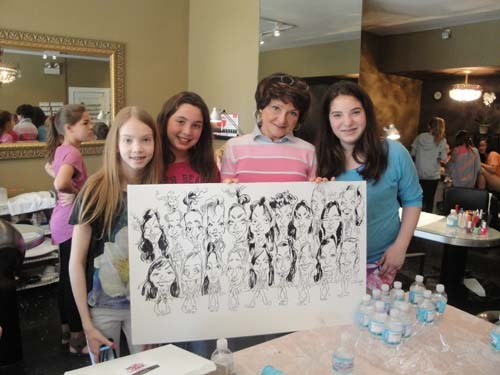 At the end, the colorfully manicured girls pulled out their phones to get a shot of the finished drawing. Happy birthday, Claudia!